With 3500 annual surgeries worldwide, heart transplantation is the last resort for an increasing number of patients affected by end-stage heart failure (HF). Heart transplant (HTx) can significantly increase life expectancy of HF patients but unfortunately exercise capacity and health-related quality of life of HTx recipients are still limited, due to the increased frequency of late complications mainly owing to chronotropic incompetence because of cardiac denervation. Orthotopic heart transplantation (OHT) is the most common approach of HTx, involving the complete explantation of the native heart, making surgical denervation inevitable. Therefore, the modulation of rate- and load-contractility relationship of the donor heart is significantly altered after transplantation even if using different surgical techniques. Addressing this fundamental clinical problem is the main goal of NeuHeart, that will be furthered by specifically investigating the physiology of denervated heart which will facilitate the development of a bioelectronic solution based on the closed-loop neuromodulation of the vagus nerve (VN), using a regenerative neural interface (for VN stimulation) and implanted artificial sensors (to record sensory information and close the loop). 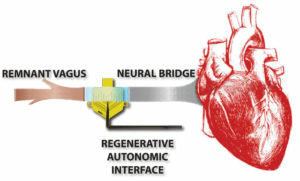 This cardiac smart neuroprosthesis will be tested in a swine model of OHT to demonstrate the feasibility of artificially re-establising vagal control in a denervated heart, by re-enabling the cardiac-vagal connection: the overall research output of the project will deliver multiple impacts, remarkably contributing to heart transplant science (fundamental research), help in the constitution of a new treatment paradigm for heart failure (clinics and society), and reach into the emerging industry of bioelectronic medicine (technology market), guaranteeing Europe a position of ‘first mover’ into this field.